(Nanowerk News) Introducing four genes from bacteria and spinach has enabled researchers at the Delft University of Technology to improve the production of bioethanol with yeast by using carbon dioxide. Their findings were published last week in the Biotechnology for Biofuels journal ("Carbon dioxide fixation by Calvin-Cycle enzymes improves ethanol yield in yeast"). 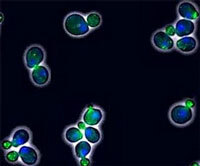 Saccharomyces cerevisiae Bioethanol is made by the Saccharomyces cerevisiae yeast using sugars from plant material. The yeast is the same micro-organism that produces alcohol in beer and wine. The production of bioethanol is increasing rapidly as a result of its use as car fuel. At 110 billion litres a year, it is the largest product of the industrial biotechnology sector. Any improvements in the process could therefore lead to major savings. Not all sugars are converted into the end-product ethanol; some are also lost through the formation of a by-product, glycerol. Until recently, this was seen as an inevitable part of the process. The researchers have now succeeded in reducing the formation of glycerol, by introducing enzymes from the Calvin cycle in the yeast. The Calvin cycle also occurs in photosynthesis, in which CO2 is fixated by plants. As part of the research project at TU Delft, the Rubisco enzyme from a CO2-fixating bacterium, together with a spinach gene, has been introduced into yeast. With two auxiliary genes from the E.coli bacterium, they ensure that the yeast can use CO2 to markedly reduce the formation of glycerol. As a result, much more sugar remains that can be converted into bioethanol. Because of this intervention, the bioethanol yield from the process is eleven per cent higher, while the production of glycerol is ninety per cent less. A patent for the discovery has already been applied for, and the next step is to scale the process up, in cooperation with industry. The researchers believe that it will be possible to apply the process on an industrial scale within a few years.